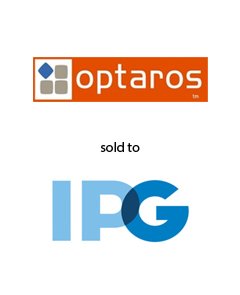 AGC Partners is pleased to announce that its client, Optaros, Inc. (backed by .406 Ventures, General Catalyst Partners, Charles River Ventures and Globespan Capital Partners), a next generation digital commerce services provider, has been acquired by Interpublic Group (market capitalization of $8.4 billion), a leading global provider of advertising and marketing services. The addition of Optaros’ eCommerce capabilities will augment Interpublic’s digital offerings across its broad platform. With a team led by Linda Gridley, AGC Partners acted as sole financial advisor to Optaros.